Howdy, folks! 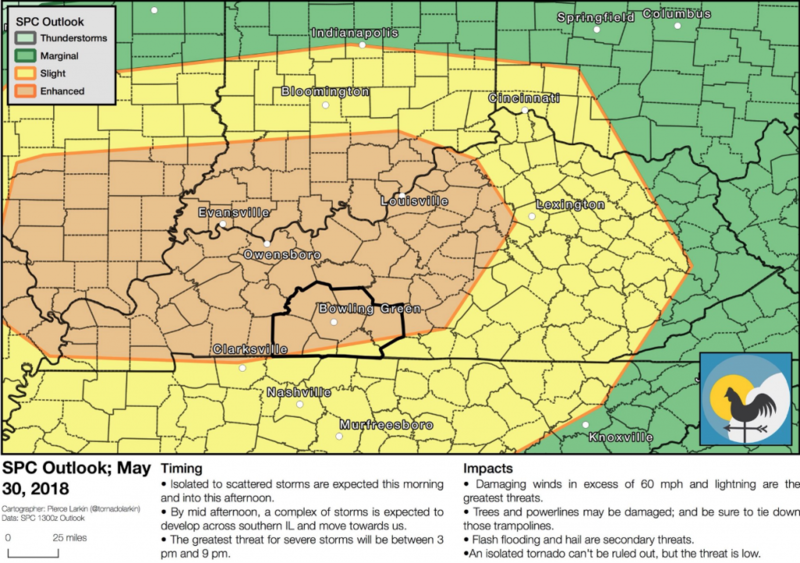 Our atmosphere will become ripe with ingredients for potential severe weather this afternoon. Temperatures in the upper 80’s, high humidity, a low pressure system, and wind shear have come together, and will provide a conducive environment for inclement weather before a quieter weekend ahead. After Alberto drenched much of our area this week, it’s left us with ample moisture and hot temperatures that will charge the atmosphere. This afternoon and evening (current thinking is ~3p – 9p), scattered severe storms capable of damaging wind gusts, large hail, and short-lived tornadoes may occur. Fortunately, conditions are not completely ideal for severe weather today. The conditions are better just to our west. Here, wind shear will not be as strong, and showers that might form this morning would limit later severe development. Regardless of severe storms or not, it will feel very hot today in the heat and humidity. Also, even non-severe thunderstorms could create flooding due to their rain falling on already saturated ground. Rain showers are likely tomorrow with a high in the low 80’s and light winds. Upper level wind shear will return to being low taking away our severe thunderstorm chances. An isolated shower is possible tomorrow night, and the low will be in the lower 70’s with high humidity. Saturday looks to be clear with highs in the lower 90’s. Overnight Saturday some showers are possible which may continue into Sunday. No severe is expected, at least on Saturday at this point. Follow @wxornotbg for the latest updates.